37% Verdelho (from the oldest block in SA – planted in Stellenbosch some 20 years ago), 31% Chenin Blanc (Swartland), 15% Grenache (Stellenbosch), 12% Roussanne (Voor-Paardeberg) and 5% Clairette Blanche (Stellenbosch). The Grenache Blanc is fermented on the skins for seven days; the Roussanne and Clairette Blanche matured in amphorae. The nose displays a herbal top note before pear, white peach, green apple and citrus as well as a hint of reduction. The palate is light, fresh and elegant. This is a delicate, detailed wine – plenty of flavour but very subtle, the finish long and pithy. Alcohol: 13%. 33% Cinsault (Darling and Stellenbosch, 30% Grenache (Grenache), 21% Syrah (Swartland) and 16% Carignan (Wellington). An intoxicating nose of lavender, red and black fruit, white pepper and spice. The palate is pure and fresh with fine tannins – has a lovely energy about it. The finish, meanwhile, is long and gently savoury. Lip-smacking stuff. Alcohol: 13%. From a 1977 Durbanville vineyard planted on shale. Top notes of fynbos and honeysuckle before naartjie and stone fruit plus a slight nutty, flor-like quality on the nose while the palate displays good weight and tannic texture. Has a real presence about it. Alcohol: 13.5%. From a 1977 Piekenierskloof vineyard planted on decomposed sandstone. A pretty nose with a floral top note before citrus and peach while a hint of reduction lends interest. The palate is very focused and tight – lovely fruit definition before a long and salty finish. Shows a real lightness of touch – so understated yet so impactful. Alcohol: 13.5%. Great scores from a great winemaker. Firstly, Im no expert and know nothing more than the average person that visits your site. Secondly, I’ve always wondered why the “entry level” or wines that retail for less always score less. The Lindi Carien takes more effort to make, more components to get spot on, more skill to get the blend right. Same goes for the Cartology, one of my favourites from the all-star lineup that is Alheit Vineyards. So does the price influence the score is what Im trying to say, will the Lindi Carien have score more if they all went for the same price? Thirdly, In my humble opinion the Lindi Carien improved on last year yet the scores are the same? Hi Martin, For me, it’s not about wines “that retail for less” inevitably scoring lower but rather that Lindi Carien and Cartology are multi-regional while the higher priced wines are single vineyard. Clearly there’s a great deal of skill required when it comes to blending but I just find the single-vineyard wines that much more profound – the imagination to interpret just one site and then the dexterity to deliver beauty in liquid form is what great wines ultimately come down to. 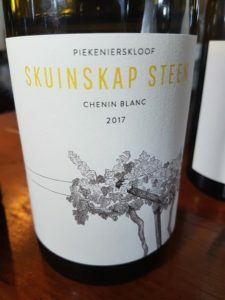 Volume also comes into it – Cartology is typically some 70 barrels – no mean achievement to make wine of this quality in this quantity but I think what happens to a certain degree is that intricacy gets lost – keep Huilkrans out of Cartology and kaboom. As to your third question, I tend to agree that both the Lindi Carien and the Howard John 2017s are the best yet from Lourens but I couldn’t get to another point in my head – that’s the inadequacy of the 100=point system for you!